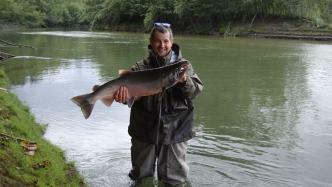 Fishing base "KAMCHATKA" invites amateurs and professionals to fishing in the Kamchatka taiga. We are located between two ridges in the valley of the Kamchatka River and our poet’s flora and fauna are unique. The base is located at a distance of 378 km from the airport of Yelizovo, where our representative will meet you. We catch: Kizuch, Mikizha, Kharius, Kunzha, Golets, Keta. The cost of the tour includes: transfer from the airport to the base and back; accommodation in houses of the appropriate category (the comfort of living depends on the category of house chosen by you); 3 meals a day; unlimited number of trips to the boats with a personal huntsman-guide (fishing starts at dawn and ends at sunset); Russian bath euro standard. Waiting for you! A weekly fishing tour of the all-inclusive program (transfer, accommodation, meals, fishing) in comfortable conditions and with quality fishing on the Kamchatka taiga rivers.